Who doesn' love potatoes? And if they are shaped into cute smileys and deep fried, the youngsters will be even more happier! Try these easy-to-make potato smileys - few ingredients, no equipments needed to shape and these are ready in a few minutes. Peel, boil and mash potatoes until there are no lumps. Place mashed potatoes in a bowl and add in the rest of the other ingredients except oil. Use more breadcrumbs if needed to mix and form a dough. Now divide into small balls. Flatten each ball. With a straw, poke in two eyes. Then with the curved end of a teaspoon, create a smile shape on the flattened potato dough. Once semi hot, dip the potato smileys gently and fry until golden brown. Yup, there you go! Much on these Yummy, Easy to Make Potato Smiley Fritters as a party appetizer, or for a kiddie party or an after school snack or perhaps the best snack for a rainy day. You can add thinly sliced spinach leaves in the mix and serve some healthy potato smileys. 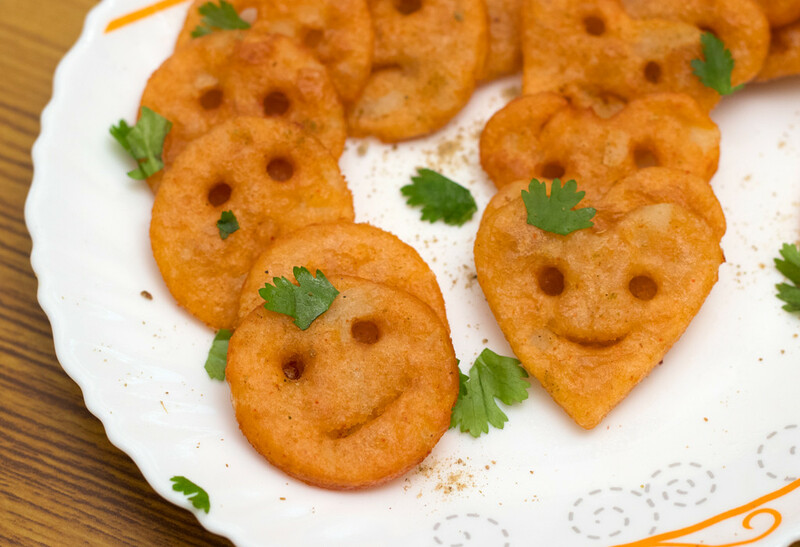 Also, get creative and try including some mashed sweet potatoes and give a sweet twist to these smileys.